For consistency, your website title and your domain name (or website URL) should be the same as your business name. If you have a physical shop or business, your website name should be consistent with your offline name so customers can recognize your online business. 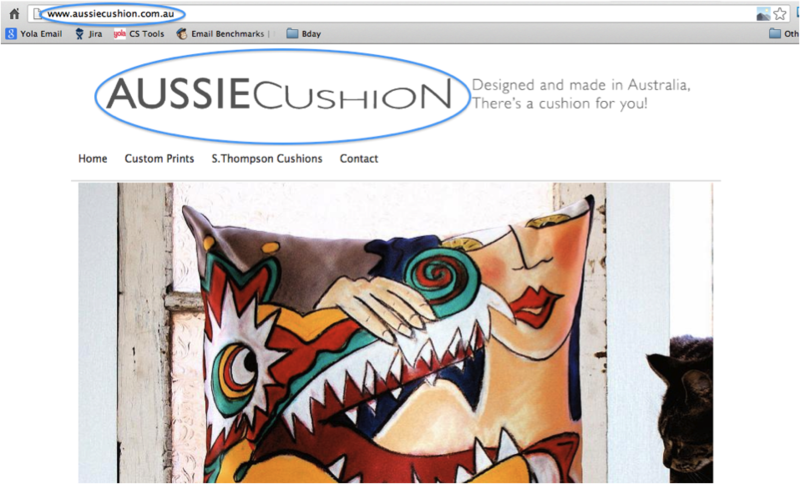 Aussie Cushion uses their business name in their logo/website title and also in their URL. 1. Keep it short – A long website URL will take up a lot of space in your header and is likely to extend across your webpage, making your header and navigation look cluttered. Plus if your website name is shorter, it’ll be easier for your customers to remember. If you want a longer name or already have your business name established, you can always use acronyms for your business or your URL. For example, American Airlines’s website is www.aa.com but they also have www.americanairlines.com which redirects to the previous URL. 2. Don’t include your domain extension – Although you should include your business name in your URL, there is no need to include the domain extension (the www and the .COM parts) in your web name. For example Puny Pixel’s URL is www.punypixel.com, however their web name on their site is simply Puny Pixel. 3. Make it relevant – Make sure to chose a name that reflects what your website is about. A relevant name will help to give customers a clear indication as to why they should visit your website. 1. Consider other extensions – If your first choice .COM domain is not available and you are a worldwide company, consider another domain extension such as a .CO domain which ranks identically to .COM in search results. If you are a brick-and-mortar business or services business targeting a specific location, consider choosing a local domain extension (e.g. .CA if you’re based in Canada or .CO.UK if you’re in the UK). This will help your search ranking when people search for the services you offer in the country you operate in. 2. Consider length – As with your website name, your URL should not be too long, as it will be difficult to remember and customers will be more likely to misspell it. If you have a subdomain like www.yourwebsite.yolasite.com, consider getting a custom domain like www.yourwebsite.com which will be more memorable. You can browse and purchase custom domains through Yola here. 3. Consider adding a keyword – If your first choice domain name is already taken, consider adding a general keyword to your URL to explain what you offer – for example, theshortcuthairdressing.co.uk. 4. Avoid hyphens and underscores – Hyphens and underscores in your domain name do not make your URL look credible and can, in fact, make it look spammy. They are also easy to forget when users are typing your web address and when the web address is told to another person verbally, so avoid using these in your domain if possible.